Alva sees 3 annual division 3/4 events run by 3 different clubs – all of whom train here at different times. CR Cats, (contact secretary@crcats.org) the most active slalom club in Scotland, train here Monday, Tuesday and Thursday evenings from 1630 to 1830. Stirling Canoe Club train on Mondays and Wednesdays from 1830 to 2000. Several other clubs use the facilities at other times, or join in with the existing sessions. 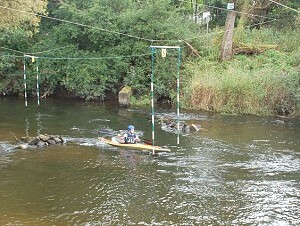 The course is sited on the River Devon, about 1 mile east of Alva village. It is primarily slow moving, flat water, but there is a small “fall” in the centre of the course, and additional eddies have been constructed by the clubs to provide more options for courses. The course is floodlit to allow for winter evening training, and there are heated changing facilities and a flush toilet available on site. Colorado Construction have helped significantly during 2011-2012 to add to these facilities and assist with managing the river to keep this as one of the most used training sites in Scotland, and in recognition of this the site is known as the “Colorado Canoeing Centre of Excellence”, or CCCE for short! The winter of 2011/12 saw a 3 race, handicap winter series being introduced, and it is hoped this will become an annual event, open to all. 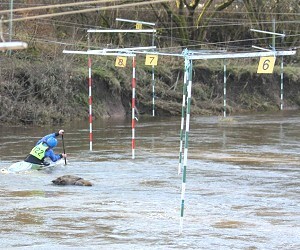 Contact CR Cats for more details, or keep an eye on www.canoeslalom.co.uk!